Shortly after Mama died, I was at the house with Dad and I saw something in the kitchen I had never noticed before. On a small hook next to a cabinet hung a few little plastic angels suspended by metallic gold thread. They were tiny and cheap, and I found out later that they glow in the dark! I don’t know where she got them, if they were a gift or if she had bought them herself. I can imagine that they might have been attached to some sort of small present as part of the wrapping. Seeing those little angels at this time of bereavement brought me an odd sort of comfort, and I asked Dad if I could take them home with me. I don’t think he had ever noticed them hanging there either, and he gave me his blessing to take them home. I later received a catalog in the mail and, as I was looking through its pages of gadgets and knick-knacks, a picture of Mama’s kitchen angels jumped out at me! They came in sets of 10 and were very inexpensive, so I bought a bunch of them. I figured I would use them in craft projects, gift wrapping and the like. When Mom Cutshaw died, she had requested a closed casket, so I asked one of the funeral home men to slip one of them into her casket, as a little temporary parting gift from me. And again, one of these little plastic angels gave me a peculiar sort of comfort. 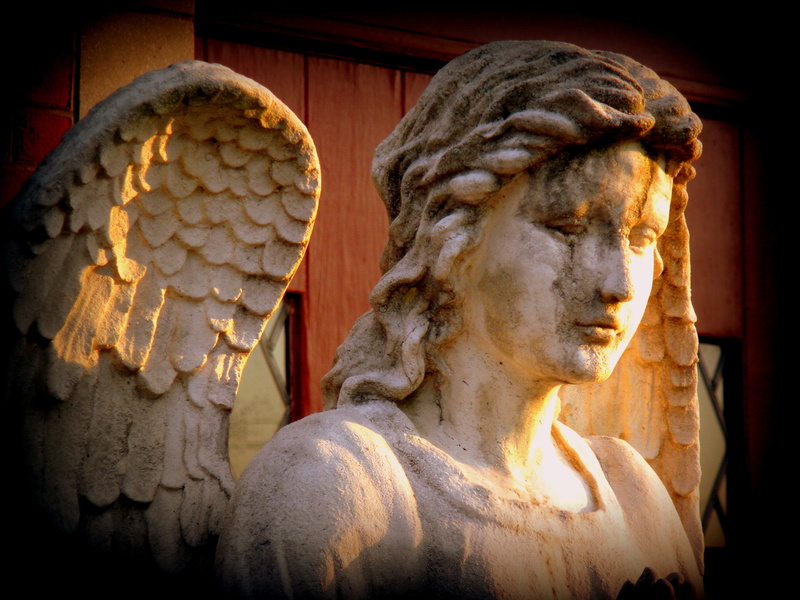 Before and since, I have collected angel figurines and jewelry, and I enjoy taking photos of angels where I see them. 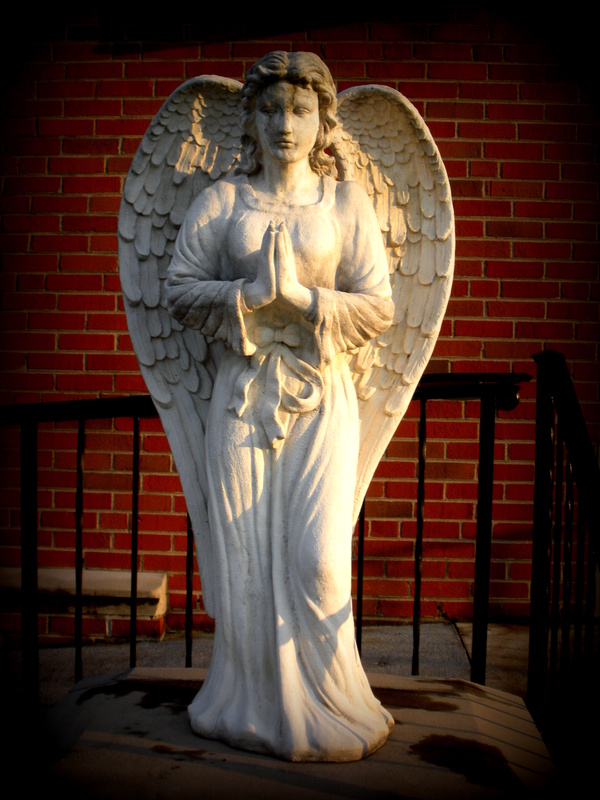 A church near my house has a beautiful angel next to its majestic red front door. She is almost the size of a real person. On my way home one afternoon when the sunlight was especially pretty, I stopped to photograph the church, its arched door, old-fashioned bell, historic cornerstone and steeple, and especially that lovely angel. From the street as I drove past, she looked like she was made of marble, but up close, I could see that she is really made of concrete. Whoever made her gave her detailed wings, a flowing, drapey gown, praying hands and a serene face. A face I found, again, strangely comforting. I took a class last year that had students fill out a form and answer questions regularly before our individual meetings with our supervisor. One of those questions was, “Where have you found God this week?” In my faith and my worldview, I find Him everywhere, in big things and small ones…because I choose to look for Him everywhere. I’m not saying that I can always make sense of what He’s up to or that I understand how He’s working all the time, because I don’t. But I know He’s there. I have found Him in the most unlikely places, maybe more often than in the confines of a church building. I’ve seen Him in the faces of people who, stricken with their own grief, somehow manage to reach out and comfort others. I have felt Him in the embraces of my family and friends when no words could offer solace. I have heard Him in music and birdsong and the sound of ocean waves. And He has sent me comfort and peace in the form of angels. 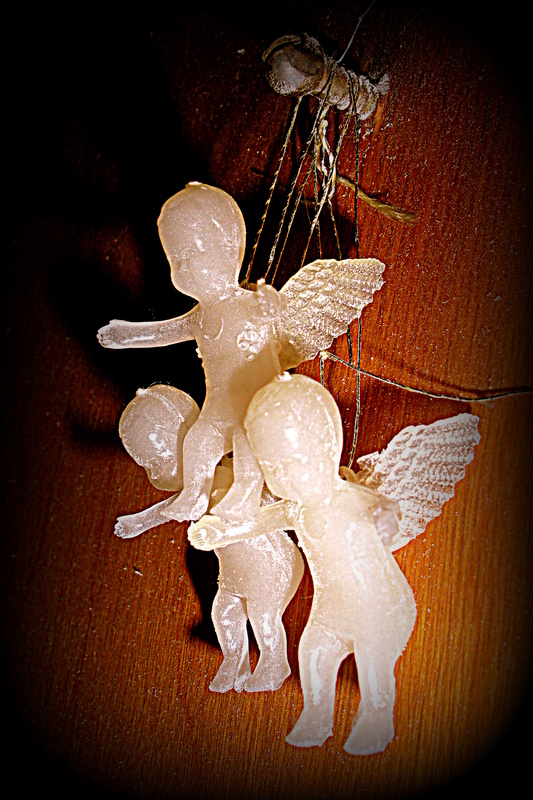 Even (or especially) in Mama’s tiny, glow-in-the-dark plastic angels.